The team at Pemberton Appliance is here to make sure that your standby generator is ready to keep your home running while the rest of the neighborhood's electricity is out. We have years of experience in installing, repairing and maintaining standby generators. Call us today to schedule your generator spring maintenance. 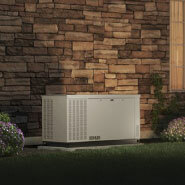 Give the experts at Pemberton Appliance a call today to ensure that your standby generator will work the way it should every time you need it. We are your local generator service experts. Our team will walk through your generator piece by piece to ensure that it is operating as efficiently and reliably as possible.